With European regulators imposing restrictive new data privacy rules on American tech companies last month, and a seemingly endless string of scandals that have bombarded Facebook, the fact that tech shares are back at or near their all-time highs might set off red flags for some. 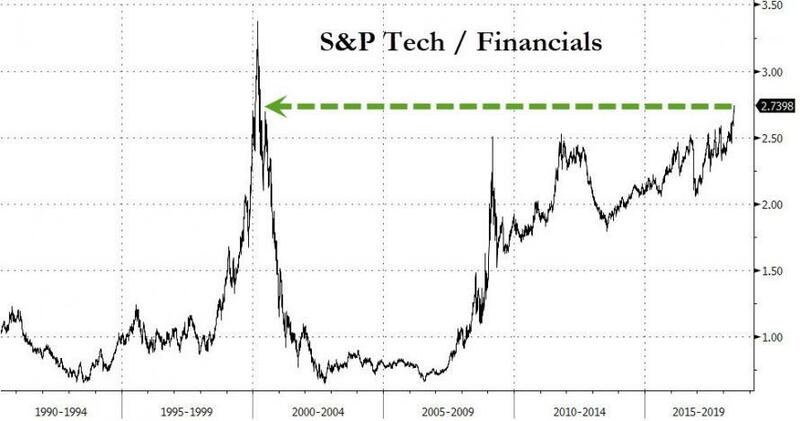 After all, as we pointed out earlier this week, the last time the tech sector was more valuable than this, relative to financials, was at the very peak of the Dot-Com bubble in March 2000. Those disruptions demonstrated the outsize influence that technology has on the main benchmarks (not to mention on volatility as a whole). As we've pointed out many times, five stocks, Facebook, Apple, Amazon, Netflix and Google parent Alphabet - otherwise known as FANG + Apple - comprise some 25% of the value of the Nasdaq Composite. Tech stocks contributed 75% of the S&P 500's return in May, according to Bank of America. They now represent 26% of the index. So, unlike most other sectors, when tech blows up, it's likely to take most of the market with it. Still, despite those warnings - and the growing backlash against the sector - the Wall Street Journal pointed out on Friday that, while there are lingering concerns, most investors see earnings prospects as enough of a bulwark against trade or regulatory issues. Just a few months ago, investors dumped big positions in tech stocks, wiping out $601 billion in market value from the S&P 500 tech sector alone in just three weeks. Their concern: more regulation and consumer scrutiny over data privacy. Now, the Nasdaq Composite is hitting new highs and the MSCI World Information Technology sector is up 9.1% this quarter—currently outperforming the wider MSCI World Index by the largest margin since the dot-com era. Although tech stocks wobbled near the end of the past week after a long streak of gains, better-than-expected first-quarter earnings and signs that U.S. companies are spending more on technology have helped the sector regain its dominant position. Facebook Inc. shares traded around records this past week and Apple Inc. is again within striking distance of becoming the first $1 trillion U.S. company. Chinese e-commerce titan Alibaba Group Holding Ltd. and internet search giant Baidu Inc. have recovered from double-digit percentage declines earlier this year to rise 12% and 18% this quarter, respectively. Even Europe’s small technology sector has outperformed the Stoxx Europe 600 by 8 percentage points over that period. The threat to the sector of increased regulation and a global trade war haven’t completely gone away. But convinced about these companies’ earnings prospects, investors poured $2.3 billion into tech-sector funds in the week through Wednesday, the second-largest weekly addition on record, according to EPFR Global, dwarfing any outflows in February, March or April combined. Matthew Peron, chief investment officer of City National Rochdale, say the "tech worries were misplaced" and that "we're in a growth cycle, and ultimately I don't see trade or political dust-ups derailing what is a secular issue." And that feeling from mid-March that the uproar over data-privacy could have a lasting impact on tech's valuation? It's already gone, thanks in part to a strong earnings report. "There was this feeling around data protection that this was the beginning of the end—no one would allow their information to be shared," said David Older, head of equities at asset manager Carmignac, who invested an additional $150 million into Facebook as it fell on a bet that its revenue wouldn’t be affected. In late April, Facebook’s first-quarter results showed robust numbers for daily active users and advertising revenues. That has helped its shares climb roughly 27% since their low point in the selloff. With everything from trade policy to regulation looking so uncertain, some say earnings are the only metric an investor can trust. "What do equity investors feel they can really count on now? 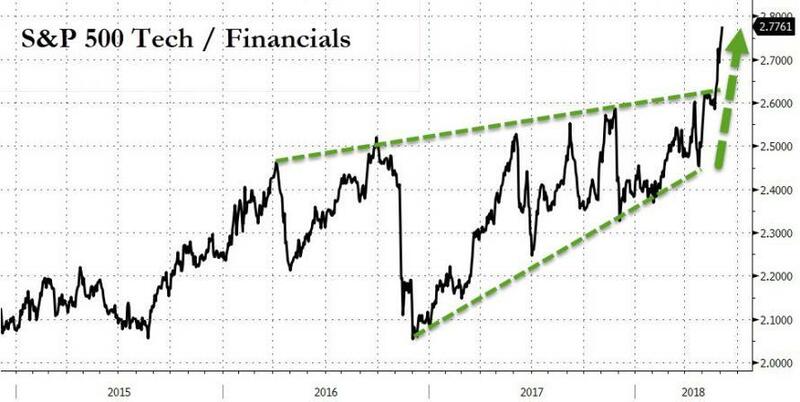 It’s not trade policy, not the [Federal Reserve], it’s earnings," said Dave Donabedian, chief investment officer at CIBC Atlantic Trust Private Wealth Management, who owns several companies in the tech sector. In another alarming sign of just how lopsided analysts' opinions on tech are, just 3.6% of analysts now hold a "sell" rating on the S&P 500 tech sector, around the lowest level since 2013. Meanwhile, the 20 biggest global tech stocks have a combined market cap of $6 trillion. And the full impact of President Trump's tax cuts haven't even been felt yet. The tech boom hasn't been restricted to the US, of course. Recent gains by Alibaba and Tencent Holdings Ltd., China’s two largest tech companies have exceeded some U.S. rivals. Both now have market capitalizations above $500 billion, placing them among the world’s top 10 most valuable companies. Tencent, the world’s largest videogame publisher by revenue, is still 13% below its record, a dynamic that investors say is appealing. "We believe Tencent has one of the most solid business models in China if not Asia overall," said Felix Lam, senior portfolio manager for Asia-Pacific equities at BNP Paribas Asset Management in Hong Kong. Indeed, tech is ascendant even in Europe, where it comprises a much smaller sliver of the market. Software company Dassault Systèmes SE is up 35% so far this year and Swiss-based Logitech International SA is up 33%. However, as most people (particularly baby boomers and Gen Xers) may soon be forced to remember, the aftermath of the previous 'different this time'-peak was pretty unpleasant.